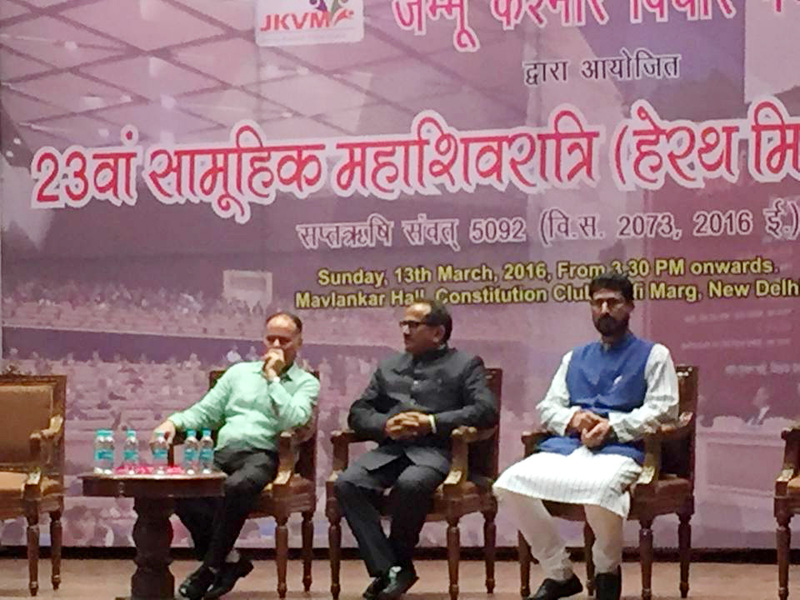 Jammu Kashmir Vichar Manch organized one of the biggest programs of the Displaced Kashmiri Pandit Community “Samoohik Shivratri Mahotsava 5091 (2016) at Mavlankhar Auditorium, Rafi Marg, New Delhi on 13th March 2016. This year the theme of the program in which Dr. Nirmal Singh ji Former Deputy Chief Minister J&K was the Chief Guest and Sh. Surender Ambardar the lone MLC from the community was the Guest of Honour, was “26 years of Exile of KP Community”. This year Mahashivrati was dedicated as a part of Millennium year celebration of Acharya Abhinavagupta, the great saint philosopher, mystic and aesthetician from Kashmir. 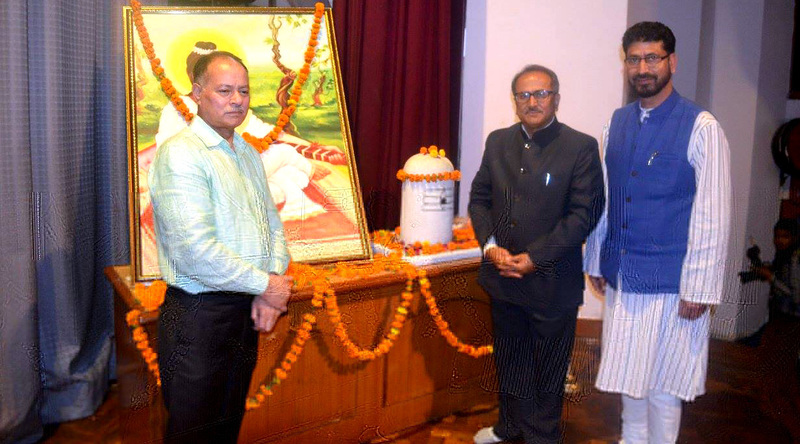 Jammu Kashmir Vichar Manch (JKVM), a frontline organisation of the nationalists of J&K, along with other nationalist took the required initiative to ensure that timeless life philosophy propounded by Acharya Abhinavgupta and remind present generation about the life and works of this great son of India intellectuals. It is important to commemorate the life and works this great Personality in the millennia year of his bodily existence. Speaking on the occasion Dr. Nirmal Singh, who travelled all the way from Jammu to attend the event, assured the displaced community of every possible help in mitigating the problems faced by it. Praising the resilience of the community even in adversity, He stressed the need to inculcate values based on civilisation ethos of Kashmir-the land of Shiva. Dr. Singh ji underlined the strong bonds of unity and the sense of belonging among over 100 crore strong Hindu society of India and around 6 crore Hindus living across the globe. These bonds need to be further nourished, he added. Dr. Nirmal Singh ji, expressed optimism about the intentions and ability of the BJP led NDA government in ensuring return and rehabilitation of the displaced community back in valley. 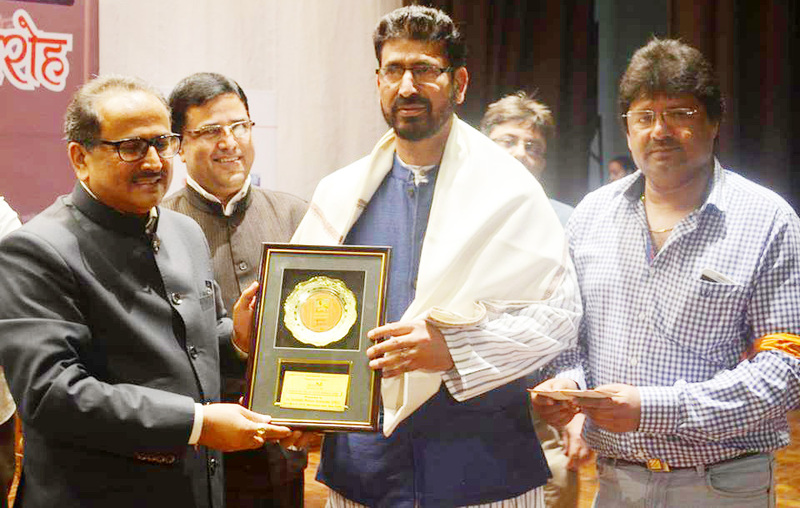 He praised the efforts of JKVM in preserving and propagation of cultural among youngsters. Exhibition on the struggle of “26 years of Exile of KP Community” was highly appreciated by the honourable guest. While delivering the address he praised the courage and dedication of the community in making every effort to preserve its cultural ethos and expressed his joy over the participation of youngsters and children in talent display events. Samoohik Mahashivratri Mahotsava is organised annually by JKVM since last 23 years and has emerged as one of the eagerly looked forward events of the community in NCR. The programme witnesses largest gathering of Kashmiri Hindu Community in NCR and has helped in reinforcing cultural importance and bonding in the society. The programme is a bouquet of cultural items, performance by children, kashmiri speaking competition, religious & social discourse. The program has two separate but interlinked components; one that of competition of various types among the children and second is the main function that includes felicitation of different categories and deliverance of socially relevant messages. Function started with children’s competitions in various categories like on spot painting, Kashmiri Speaking (Lalita Koul Sahib Memorial award), the best talent child in Singing, Dancing and instrumentation named Gaashtarukh or the community star. Shri. Surender Ambardar who was guest of honour demanded fact finding “Truth Commission” committee for the turmoil which happened on 1989 -1990. He identified several areas like cultural preservance, literature in exile, promotion of mother tongue etc to demonstrate the un paralleled struggle of the community against all odds. Terming forced expulsion of the community from Kashmir as the exodus of a civilisation, he underlined the need to have a fresh look on return and rehabilitation in this context. Shri. Surender Ambardar MLC demanded “Autonomous Smart City” for Kashmiri Pandits for around 5 lakhs pundits were forced to leave the valley. He emphasis that Modi ji planning to develop 100 Smart cities and he demanded one for Kashmiri Pandits. Pt. Ambardar asked the community to pay additional attention to ensure that community youth are encouraged to join administrative services as there is a dearth of good officers both in the state and national level. This will be in line with the tradition of the community to contribute to the national cause. Dr. Rajnish Mishra Professor Special Centre for Sanskrit Studies, Jawaharlal Nehru University, New Delhi. He has done research on ”Kashmir Shaivism” with emphasis on Achyara Abhinavgupt. Dr. Mishra gave the deep inside on Kashmir, the beloved land of our ancestors has gifted to the world numerous Yogis, Rishis, philosophers and intellectual gems who by virtue of their spiritual knowledge, extensive sacrament and self realization enriched human understanding in a number of fields earning the tag Land of Knowledge (Rishi-vaer) in the process for that sacred territory. Acharya Abhinavagupta is an important icon in this tradition. He was a great philosopher and literary critic, mystic and aestheticians. He was also considered an important musician, poet, dramatist, exegete, theologian, and logician  a polymathic personality who exercised strong influences on Indian culture. In short a multi dimensional personality of extra ordinary merit. Sh. Sanjay Ganjoo, President JKVM while welcoming guests presented the report of activities organised by JKVM during last year. In his brief address he highlighted the concern of KP community and emphasised that though the community has great hope in BJP but the bureaucratic indulgence creates hurdles that need to be addressed appropriately. Sh Sanjay Ganjoo urged Dr Nirmal Singh to influence BJP so that they don’t tie their hands and compromise of Issues concerning KP Community as it will be detrimental to the National Interest. Lalitaditya Shorya Samman for exceptional act of valour for security and defence of the country was presented to Shri. Kuldeep Khoda former Director General present CVC of J&K For his outstanding contribution towards National Security as the most successful Director General of Police J&K. Shri. Omkar Nath Bhat (Shabnam) were felicitated with Pt. Krishnajoo Razdan Saraswati Samman for outstanding performance in the field of literature. Shryabhat Kirti Samman for substantial and notable contribution to the social cause was awarded to two great dignitaries of the community: Shri. Chaman Lal Gadoo for their outstanding service to the community. 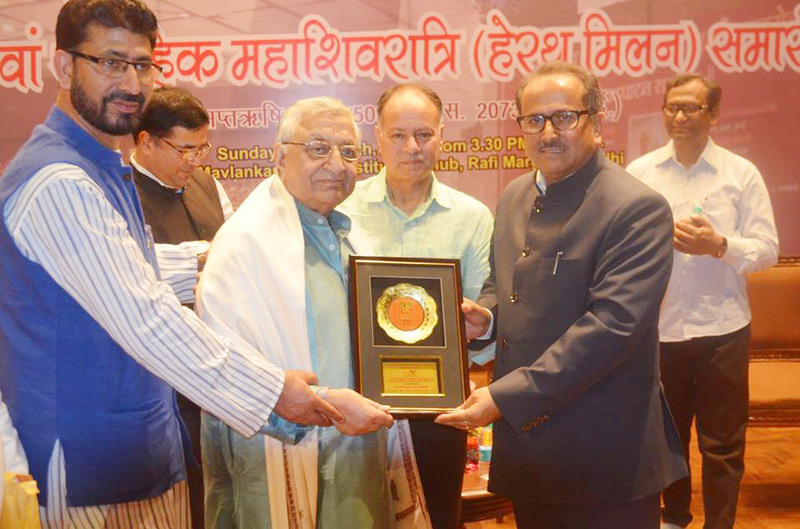 Yashaskar Samman for substantial and notable contribution to the cause of the community was Awarded to Shri. Sanjay Dhar. 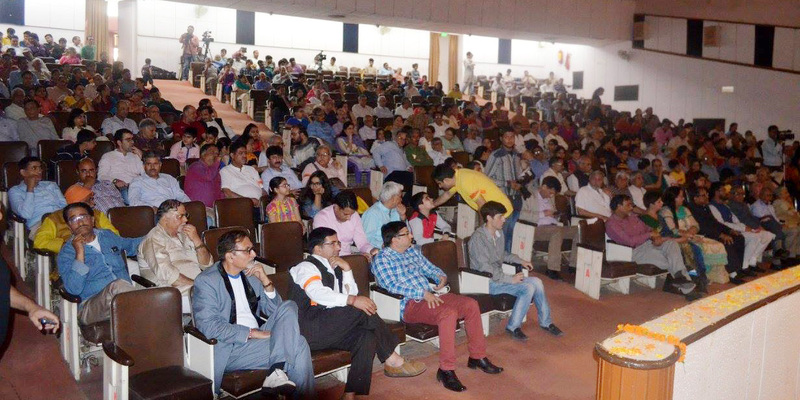 Jammu Kashmir Vichar Manch was the first community organisation to realise the threat to spoken language. Hence an innovative method to incentivise the children to speak and converse in their mother tongue was conceived and One more category of awards for kids speaking in Kashmiri was launched. This was subsequently rechristened as Smt. Lalita Koul Sahib Memorial Award for best speaker/conversationalist after sh. AN Kaul Sahib decided to reward the kids for speaking Kashmiri. It was in the year 2006. Ever since it continues to be an important aspect of Samoohik Mahashivratri Mahotsava event. It has two categories of competitors 1. Upto 14 years of age and 2. From 15-22 years of age. A cash award of Rs. 3000 and Rs 7000 is given to the best speakers in the two categories respectively. Around 50 Kids participated in this category this year. Regrettably this time no one participated in senior category and those who participated in junior level had not worked hard-enough to impress the jury. Around 50 kids participated in drawing competition on a theme on Kashmir. Sh. Ajay Bharti ji Organizing Secretary of JKVM delivered vote of thanks. He expressed gratitude to the guests and to all organisations and prominent people of the society who come and were part of this program. Progamme was conducted by Manoj Bhan and Smt. Sunita Pandit.